Alphie helps Bill Briggs conduct a FastTrack Phonics lesson in his kindergarten class at Thousand Oaks. There’s a new member of the BUSD family who really stands out – which is quite a feat when you’re only a foot tall. He’s bright green and furry, and his name is “Alphie.” As you might guess from his name, he works with the alphabet. 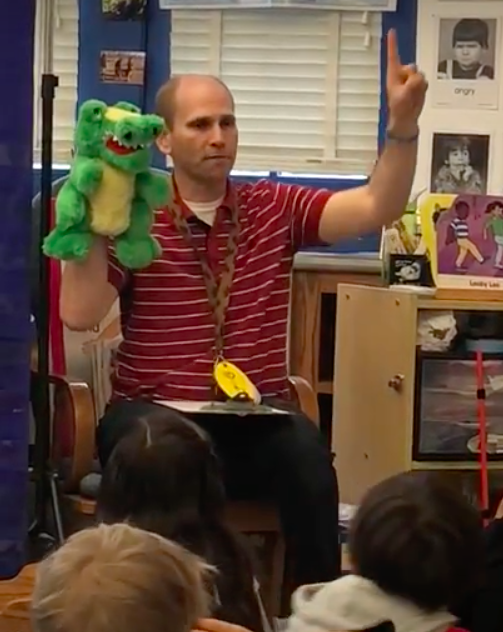 Alphie – an alligator puppet – is helping strengthen the way we teach phonic and phonemic awareness so that children understand the relationship between letters and sounds as they learn to read. Our curriculum has included phonics in the past, but this school year we’re introducing a more explicit and systematic approach, using the FastTrack Phonics program. We’re also devoting more time to this crucial building block for reading – 20 minutes or more daily for students in all K-3 classrooms, the most formative school years for literacy. “For many years BUSD has struggled with a pronounced achievement/opportunity gap,” says Maggie Riddle, the BUSD Director of Schools. In a report on FastTrack Phonics presented to the School Board in June, Ms. Riddle noted, “Too many of our African American and English Language Learner students are not at grade level reading proficiency by the end of 3rd grade. 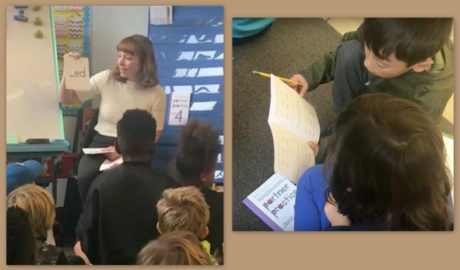 Riddle added that all students benefit from phonics instruction because in addition to helping students learn to read, phonics and phonemic awareness instruction helps students become excellent spellers, improving their writing overall. Left: BUSD Literacy Coach TSA Rose James conducts a FastTrack Phonics lesson in Lisa Rossi’s 2nd grade class at Jefferson. Right: Students engage in FastTrack partner practice. Alphie belongs to a FastTrack family of classroom materials – including videos, phonics picture cards, letter-blending cards and alphabet letter strips – used to engage active young minds in whole-class interaction. The teacher-friendly and kid-friendly materials helped sway the District’s decision to adopt FastTrack Phonics over other options in a field of nine candidate programs offering explicit phonics instruction. FastTrack was further reviewed in a pilot test alongside two other programs conducted in selected K-3 classrooms this past January-May. Left: K-3 teachers and administrators participate in FastTrack Phonics training before classes start in August. Right: A display of some FastTrack classroom materials. School Board on June 13. The agenda memo and two attachments are listed in item #16 in the online agenda packet, and the oral presentation can be seen in the YouTube recording of the Board meeting, beginning at 3:11:23. The School Board approved the adoption at the Board’s June 27 meeting.